This easy to use kit consists of a cleaner and acid leak detector along with a set of battery pads. Simply apply the cleaner to the battery terminals and brush off any debris and rinse with water. 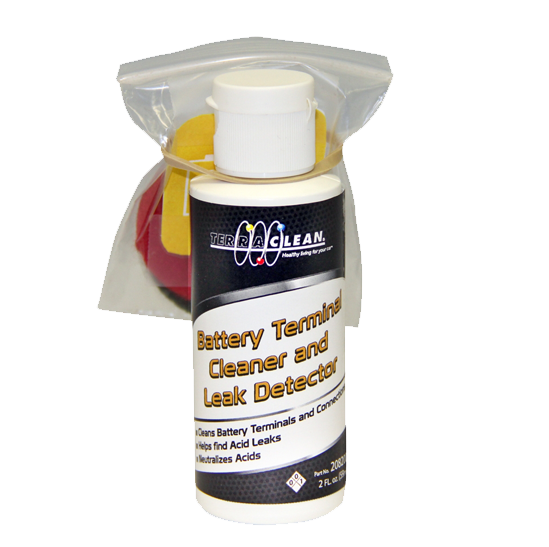 This product also contains a pink pH sensitive dye that will turn a clear yellow color when exposed to acids to help detect acid leaks from cracks in the battery case. After cleaning and drying the battery terminals, the battery pads are installed on each terminal. These pads wil fit both top and side style terminal posts. The pads contain a chemical inhibitor to protect against future corrosion.